For the first time, we can select the version of engine in new Focus ST 2015. This year Ford put on a new range of engines. The lounge will be able to order a Focus facelift with turbocharged petrol engine with power of 250 hp and diesel ST TDCi diesel 185 hp. This version will compete with the latest Volkswagen Golf GTI, more precisely GTD, which in the lounge is more expensive about 500 pounds than the latest Ford ST TDCI. Ford expects that it will be one of the biggest hits of the year. This will increase the number of purchasers and convince a larger group of people to buy this model Focus ST.
Information of ST TDCi can be compared to the first generation of the Focus ST170, which reached the first hundred in 7.9 seconds and a top speed is about 143 mph. 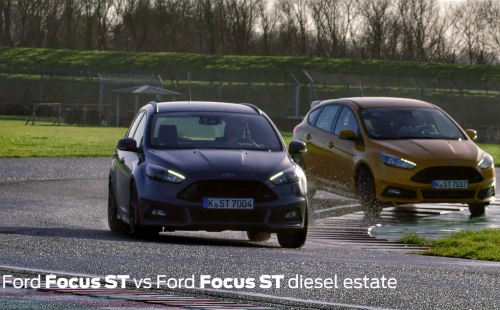 Will the new ST TDCi has the same components? No, changes have to be implemented because of the heavier construction of the diesel engine. The amendments relate, inter alia, the springs and shock absorbers front and rear, calibrated power steering EPAS and the strengthening of the engine mount. Will there be new variants of the equipment? No, there be will continue three variants. The first ST, including RECARO seats, 18-inch alloy wheels and air conditioning. Another ST-2 will cost about £1500 more, we will get the LEDs, RECARO partial leather seats and heated windshield. The last is the ST-3, includes such things as: full leather RECARO seats, bi-xenon headlamps SYNC2 and red brake calipers. The price of these pleasures is about £1300. Of course, all versions can be purchased in the available version 3 or 5-door (hatchback or station wagon). 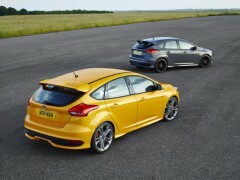 Price of the latest version of the Focus ST with diesel engine will starting at 22.195 pounds. If you have already ordered your fancy ST TDCi this application is open. Expected delivery of these models is in February 2015.